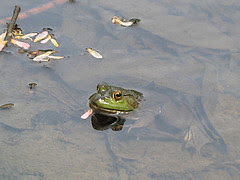 Fowl Behavior: The last frog on earth? "Did you see the special on PBS last night about frogs?" asked Mike, a painting contractor, when he saw a book on my kitchen counter about global warming. "They're dying of a fungus that inhibits them from breathing through their skin. About 5 percent are immune, so workers incubate frog eggs of the resilient ones and hope they'll survive and reproduce," Mike said. Of course, no one knows why. They do know that frogs are ONE of our "canaries in the coal mine." Are humans next? "What do we have to do to start thinking and acting differently?" I asked Mike. "What have you done to green up your painting business?" "I wish the paint manufacturers would take back the cans. No one will take them. They end up in landfills," Mike said. "Why don't you initiate a movement to change that?" "In my free time?" Mike said rhetorically. All of those small steps add up to a healthier environment, but no one is willing to take a few extra minutes to initiate a movement to change our systems. "Mike, do you have children?" "Some people say they'll change for the sake of their children. Every other organism on Earth survives by leaving a clean environment for their DNA to reproduce." "Not geese!" my husband interjected. "They leave THEIR environment clean," I said. "What can you do in your realm, Mike, so fairy tales isn't the only way your kids know about frogs?" It gave him pause for thought -- which is the antecedent to changing behavior and critical mass. Labels: critical mass, last frog on earth, what can you do? Frog fungus, when to start taking action?